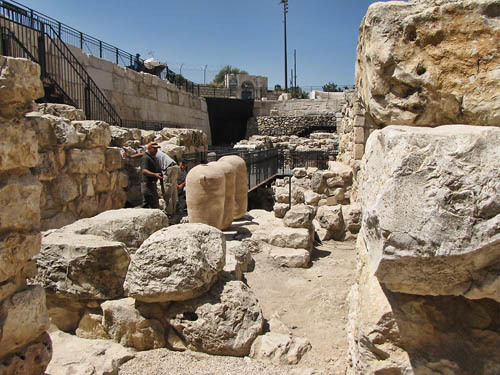 The Israel Antiquities Authority provided several good photos of the Ophel City Walls site. I thought this was an especially nice photo. The view from the site looks at the new steps leading to and from the excavation. 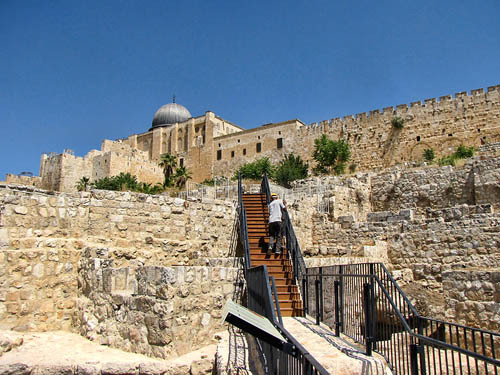 The southern wall of the temple mount enclosure is visible in the distance. Ophel City Walls site. Photo: Israel Antiquities Authority. Leen Ritmeyer provides insight into the excavation dating back to the mid-1970s when he supervised some of the excavations under the direction of Prof. Benjamin Mazar. Take a look here. The next photo shows workmen putting the finishing touches on some of the stones. Three pithoi are visible. The view is toward the southwest. Ophel City Wall site. Photo: Israel Antiquities Authority. Amazing! My knowledge is so limited… It is my understanding that the speculation is that this may be from Solomon’s construction. Have you formed an opinion on that? Have any inscriptions been found or dated yet?